Color(s): Eventhough wolf gray is most common; it may come in any shade of gray. It may or may not have a black mask. It may also be present in brindle. 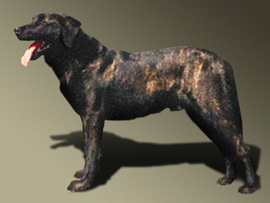 Cao De Castro Laboreiro is also called Portuguese Cattle Dog due to having been originated in Portugal. This primitive breed of dogs which is rare and difficult to obtain was developed as a guardian of livestock, family, and property. Having a weather-resistant, fat, well-bred, rough, and compact coat, they require regular brushing and may be bathed only when absolutely necessary. Cao de Castro Laboreiro breed is powerful and authoritative due to which it is deemed unsuitable for inexperienced dog owners. They are extremely protective of their family and belongings and cautious towards strangers. They are playful and patient with children and make a loyal, trustworthy and devoted companions and guardians and are certainly not recommended for homes with other dogs or household pets. Cao de Castro Laboreiro is very brainy and listens to orders issued by their owners only. Even in this case, like most other breeds early socialization and obedience is necessary. It must be kept in mind that they would not tolerate harsh or heavy-handed methods and thus training must be done with a firm, fair and consistent attitude. This breed is not recommended for city or apartment living and does best in rural areas with a job and sufficient space to roam about. Due to this breed being very rare, there are no known health problems and Dog Diseases associated with cao de castro Laboreiro.